When a lighting company faced a problem with a new commercial light designed for harsh environments, the company turned to Niantic Seal. The new light’s design required an electronic component be shielded with a customized conductive seal. This mandated the use of both a conductive seal and a non-conductive seal together. The company had previously used Niantic in a consultative role, so it presented us with the new product’s sealing requirements. Niantic’s engineers put their extensive knowledge and vast sources of industry-leading materials to work. What resulted was beyond the client’s expectations. Instead of presenting two seals, Niantic had developed a single gasket that solved the conductive and non-conductive sealing issues. 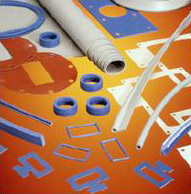 The single gasket not only exceeded product requirements, it did so at a lower cost and with a faster development time. Because of our work on this project, Niantic was placed on eight other programs with the lighting company, covering an extensive range of non-conductive and conductive materials. The bottom-line, when you evaluate Niantic Seal’s application design expertise in the industrial markets combined with an extensive selection of Performance Materials and a commitment to quality our customer’s realize they can now access premier industrial sealing technologies from a single source.